4.2 out of 5 based on 27 bloggers and 3 commenters. 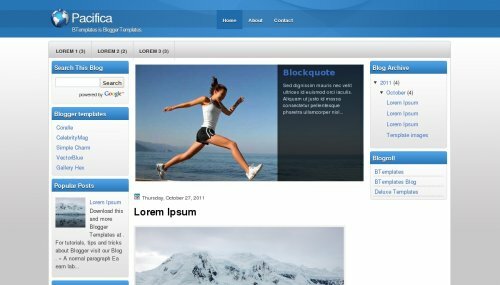 Pacifica is a free blogger template with 3 columns, left and right sidebars, slider and social bookmarking icons. Excellent template for blogs about business. Hi, Someone can explain how I can put a menu instead of having the Label? What site should I put the code? Hi, Someone can explain how I can put a menu instead of having the LOREM? What site should I put the code? Please, adsense only shows up in blog main page, but not in the post specific page. I would immensely appreciate your help.